By – Gary Ickes II – Ickes Tree Service, Inc. In our urban forest it is not uncommon to notice mistletoe growing in our trees. 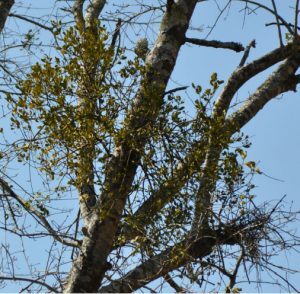 Mistletoe affects many species of trees in south Alabama and can be an indicator of an unhealthy tree and lead to further decline. The most common plants affected are in the oak family. Water and laurel oaks are both common urban trees that are highly susceptible to mistletoe. Mistletoe is not common in all species of oaks for example in the eighteen years that I have practiced arboriculture, I have seen mistletoe in live oaks only a handful of times. Outlined are factors that contribute to the occurrence of mistletoe and will provide some basic management and control recommendations, in this article. mistletoe are spread to and within trees by gravity, wind, and birds. Birds distribute the berries by passing the berries though its digestive system leaving droppings, eaten and regurgitated, or by wiping the uneaten berries from its beak on a susceptible plant part. The berry then sprouts and starts to grow. Mistletoe is a semi-parasitic plant that forms a pseudo root system into the trees cambium layer. (The cambium is a part of the tree that acts like a vascular system moving nutrients and is responsible for much of the trees growth.) Mistletoe is considered semi-parasitic because it contains its own chlorophyll for photosynthesis, however, its pseudo root system acts in much the same way as a tree’s root system. It absorbs minerals, nutrients, and water to be used in photosynthesis to produce sugars necessary for growth. Essentially mistletoe is drawing these nutrients produced by the host tree and uses them for its own growth much like the host tree draws these nutrients from the soil. dies because of an inability to produce enough sugars to survive. agents. The sooner that mistletoe is treated the better the results. environment is a harsh place for trees to survive. Urban soils are generally compacted, low in organic content and may contain a variety of foreign building materials that can change to soil PH. The first step towards healthy trees and low incidents of mistletoe is stress management in trees. Good urban tree management begins by creating an environment that has soil with low compaction, proper levels of nutrients, minerals, organic matter, and water. In arboriculture mulch and mulching around trees is the closest you can come to finding the silver bullet that contributes towards healthy trees. mistletoe has been in the tree, and the amount of tree stress will determine the types and effects of treatment. Treatment may not be suitable for all trees. from their insurance agent and references. This will ensure that the individual has the proper insurances that protect you from any accidents or injuries or damage to your property that may occur during the job on your property. I submitted this article to ACES. Beau Brodbeck and Jack Rowe rewrote and published ANR-1454.